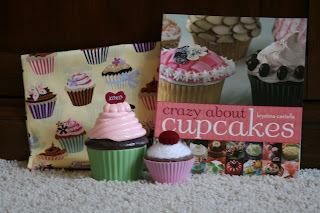 Sharon hosted a cupcake swap a little while back, and today my package arrived from Dawn. 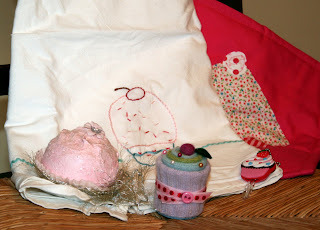 She sent me some fun stuff... a pot holder she made, a cute little key cover, a non-edible cupcake that would be super yummy if I could eat it!, and my two favorite items, the embroidered dish towel and the cute little mini-cupcake pin cushion. I sent her a cupcake themed recipe book, a pin cushion, themed fabric, and a cupcake shaped container (for pins or needles or whatever!). Thanks so much Dawn, and also thank you Sharon. This was a fun swap! The book looks familiar ~ think I've seen that, too. It had a lot of fun things to do. Geesh, I want a chocolate cupcake! Glad you like it! I especially love the key cover too! Thank you for your patience with me! Excellent swappage Ginger! I LOVE that little pincushion!